The Zenith Calibre El Primero Tourbillon Watch for Women represents the sense of luxury on every women's wrist. 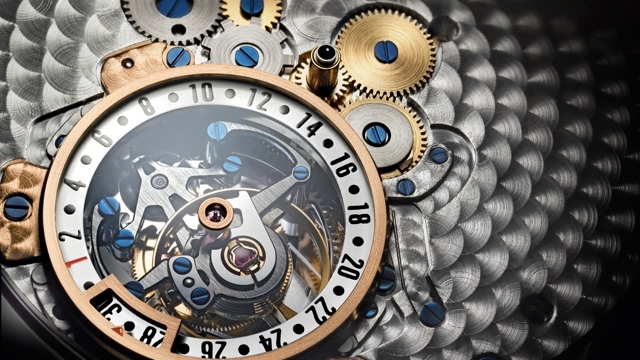 Its beauty has been revealed by the fascinating and refined mechanism. The Zenith El Primero Tourbillon for Women is an exceptional designed watch, which is an eyecatcher. This El Primero Tourbillon Watch is a well designed piece of art work. It's created for the sophisticated and elegant women, who love life, excellence and luxury. The El Primero Tourbillon Chronograph Watch for Women is Swiss made, that stands for quality and excellence. The Calibre El Primero Tourbillon has an automatic movements with unique date settings around the Tourbillon carriage. Same as most of other watches, the Zenith Calibre El Primero Tourbillon Watch for Women has hours and minutes in the centre. The Tourbillon has a carriage, that is positioned at 11 o'clock and makes one turn per minute. 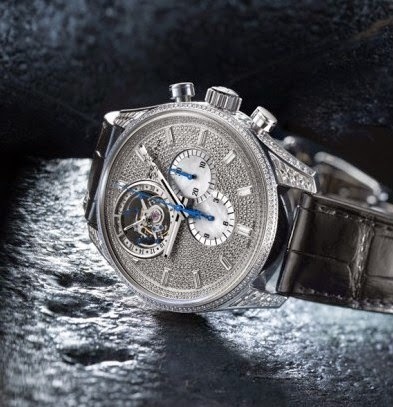 The small seconds is on the Tourbillon Carriage and the date indication is placed around the carriage. 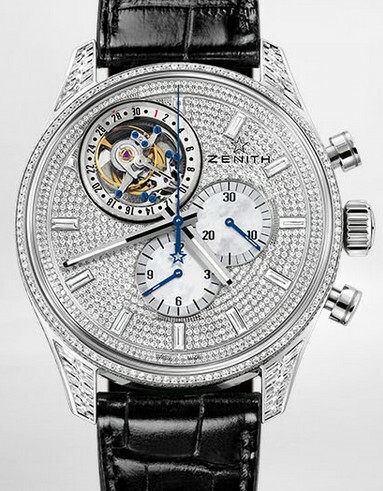 The Zenith El Primero Tourbillon Watch for Women is a Chronograph watch with excellent technique. It has a central seconds hand and also a 30 minute counter at 3 o'clock and a 12 hour at 6 o'clock. The Zenith Calibre El Primero (4035 D) Tourbillon Watch for Women is an Automatic highly luxurious Watch. It has actually a Power reserve duration of a minimum of 50 hours and a finishing Gold oscillating weight with Cotes de Geneve pattern. 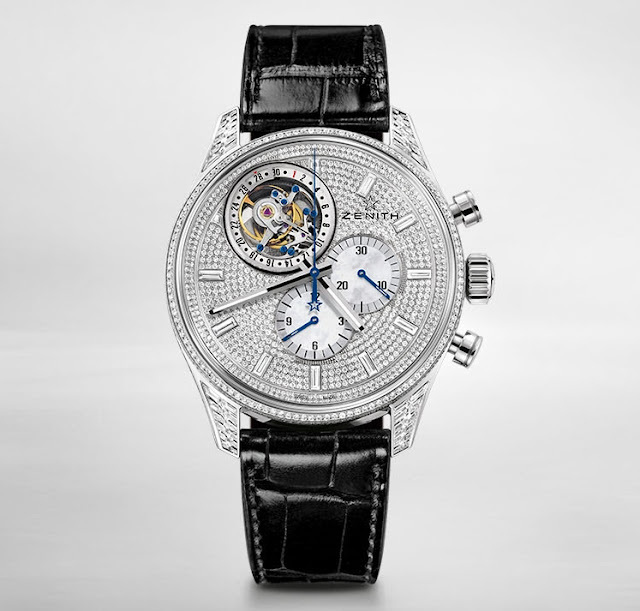 The Black Zenith El Primero Tourbillon Watch for Women is a 22K White Gold Watch that entirely sets with Diamonds. This exceptional and luxurious Tourbillon Watch has a case with Sapphire Glass and anti reflection treatment on boths sides. The Back Case of the Zenith El Primero Tourbillon Watch for Women has a transparent Sapphire glass. The Watch is water resistant untill at 3 ATM. The Dials and counters of the Zenith Calibre El Primero Tourbillon Watch are also entirely sets with Diamonds. The Counters are in Mother of Pearl. This luxurious Tourbillon Chrono Watch for women is entirely made out of White Gold and Diamonds. Even the hour markers are set with Baguette Cut Diamonds. The Blue hands are faceted, as well as Rhodium plated and coated with Super Luminova SLN C1. Zenith is a well known label that stands for quality and services. The historical Zenith watchmaking label is known for its outstanding designs, work of art, movements and technoglogy of the watches. So the Zenith El Primero Tourbillon Watch for Women is definitely worth its value and you will have a beautiful, elegant, exceptional, glamorous and luxurious Watch that will last a life time.